View Cart is currently empty. The popcorn party tubs are great for your upcoming popcorn event. They hold approximately 20 cups of popped corn. Buy these in quantity to go with a party size popcorn bag or other popcorn gift. 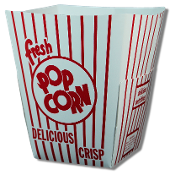 The popcorn party tubs measure 8" tall, have a square 4.5" base and a larger square 7.5" top. The popcorn party tubs are perfect for a party or office atmosphere because they can be easily labelled and stand up on their own. Furthermore, having disposable / recyclable eventware is so nice and handy. Content copyright 2013. Cornzapoppin. All rights reserved.